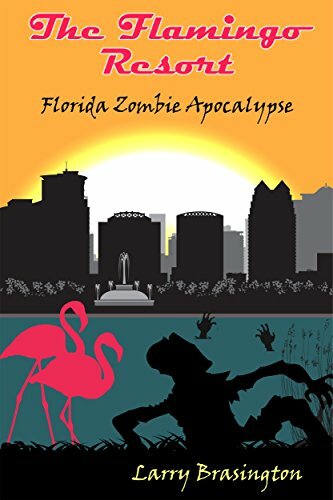 In Flamingo Resort, Detective Sam Fry and fellow survivor Jessica Lake, head to Orlando for Relaxtion and Romance following their survival of a zombie attack. Only to have the plans disrupted by a second outbreak of zomibes. Together aided by an unlikely group of heroes they try to save the day and uncover the mysterious source of the outbreaks. Humor and action. Flamingo Resort is the final part of the Florida Zombie Apocalypse. Part One is Uncle Hank’s Cabin on the Gulf Coast near Crystal River.Hank Honeycutt is home watching his TV when creatures invade his home forcing him to escape. In his flight Hank ends up at the nuclear power plant. Part 2 is set in Gainesville, Florida on a Saturday night downtown. A co-ed walking to her car after being dropped off by a friend encounters a zombie. Fearing for her life she runs to the nearest nightclub to find help. This sets off a chain of events where she meets Detective Sam Fry. Part 2 ends with a battle between zombies and police.